Updated Tuesday February 26, 2019 by Soccer. Buckingham United / CBAA Soccer is a proud host of the Referee Certification Course(Grade 8 licensing). We graduate up to 30 referees at each Final Field Session. 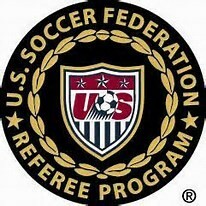 This license allows you to referee competitive youth games. This is not specific to Buckingham United or CBAA IM Soccer. New Class Dates announced. If you are interested in completing your final field session course at CBAA for certification, please check the www.epsarc.org site. The course no longer has classroom sessions, with the exception of one Field session for the final certification. All Coursework is completed online, including the exam. Register for one of our *CBAA Hosted "Entry Grade 8" clinics on EPSARC. There are no NO classroom education sessions. Attend an in-person Field Session at the Buckingham United Indoor Training Center. Helpful Referee Resources Click here. *Don't see a date listed for a CBAA Hosted Course? Contact us! You may also take a course at any other club listed!